The Nirvana Archipel Resort, with bar/restaurant, marina and animal sanctuary is located 130 km from Vientiane, the capital city of Laos, on Route13 heading towards Vang Vieng and Luang Prabang. Our comfortable, well designed bungalows nestle on an island on Nam Ngum Lake close to the banks of Tha Heua river and the fishing village of Tha Heua in the mountains. 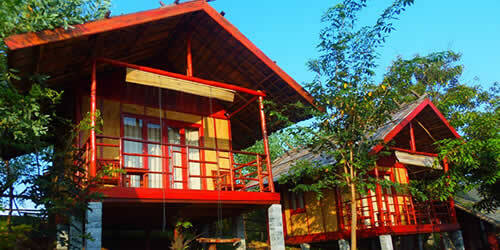 The Nirvana Resort with its lush and peaceful tropical garden is located in the Northern part of the archipelago. You will be able to feed the island monkeys or enjoy a boat ride at sunset. Many water activities are offered: jet skiing, fishing, kayaking, and many more are ready to be discovered on site. The Nirvana Archipel Resort is a small corner of paradise welcoming you for an unforgettable experience. The Nirvana Archipel is a magical place envisioned by its owner; he will make you captivated with the landscapes, water activities and animals that find a second chance in the calm of this preserved environment. 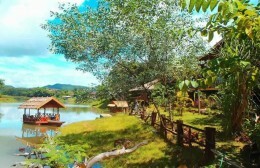 Wake up on the bank of Nam Ngum Lake where fauna and flora create a magical landscape. Our resort offers various types of accommodation according to your needs. Bungalows, Apartments, Villas and even Tents for camping. Discover and book your accommodation now. Discover a place where the beauty of the landscape mixes with the friendliness and energy of the staff. Animals that are protected and cuddled literally bloom and it is a real delight. The food, cooked with care and professionalism is delicious. The lake ride is a joyous and relaxed experience so one can enjoy the surroundings before getting back onto dry land at sunset while a sound and light show is happening. Don’t miss this Nirvana, you won’t regret it. 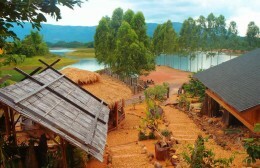 Nirvana Archipel resort in Ban Tha Heua village – awesome place. A corner of paradise where the sweet owner, Christophe will be happy to welcome you to the hundreds of islands of the lagoon. 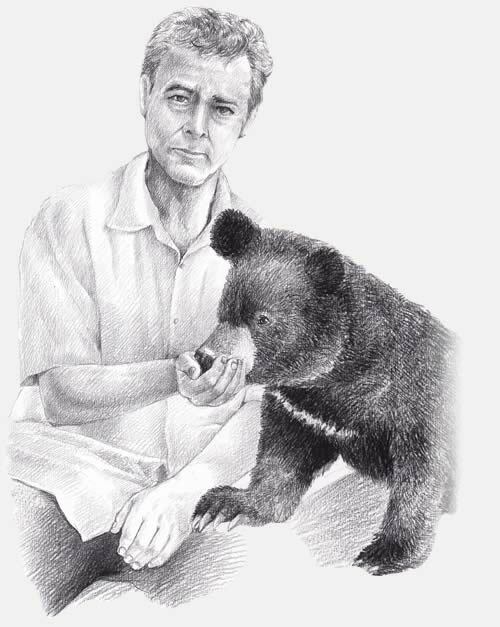 Christophe owns several islands and is taking care of animals (monkeys, leopard cats, rare birds). As well, he might make you discover the lagoon while sailing on the “bar-boat “, or you can hire his jet skis. The experience was simply magical. It is an exceptional place, where you can embrace nature. 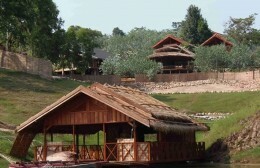 The resort is made up of individual bungalows, with AC or fan. One can enjoy a magnificent view of the lake from the balconies. The owner and director of the resort, a nice French man who is into ecology, and respect of nature, settled there 5 years ago. He is available to provide you all the information you need, and will offer you a boat ride at the end of the afternoon to feed the wild monkeys on a nearby island. 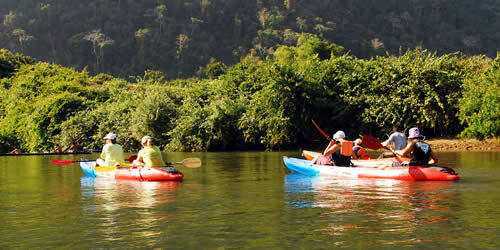 Water sports can be practiced: water- skiing, kayaking, fishing, swimming. One will never regret staying in this heavenly place. We spent a wonderful time at the resort… Friendly owners, animals just as nice LOL; boat rides, Jet Ski etc… Highly recommended… We plan to be back in April. After a long motorbike trip, I arrived by chance and was not expecting such a pleasant surprise. The beauty of the setting, and the quality of infrastructures made us feel comfortable. Finally the gentleness and professionalism of Christophe, the boss, convinced us. A really pleasant time with nice people in a splendid location. Since I discovered South East Asia and settled in Laos, I have been working to transform my vision of paradise into reality. As I am an enthusiastic lover of the environment and animals, I wanted to create an ecological place offering modern comfort so my guests could enjoy their stay fully. Within our resort and archipelago, you are able to discover Vang Vieng region and the richness of Nam Ngum Lake in the best conditions. I have created a unique setting enabling discovery, adventure, and well-being. 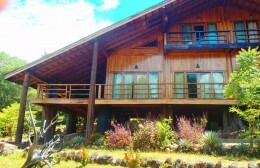 See you very soon at Nirvana Archipel Resort!